Change is a constant. However the pace and direction of change are not. Both are largely unpredictable. We are currently experiencing a period of change that is almost unprecedented in its scope, speed and global reach. This change is not only technological but, more specifically, cultural. It is change that is neither linear nor predictable but which affects many interconnected aspects of our complex system in surprising and unforeseeable ways. For many, these are exciting times, as change is the wind that fills their sails of exploration, discovery and innovation. For some, such a period of rapid change is disconcerting and threatening. In putting together this annual, we have tried to bring together a somewhat eclectic mix of articles that, taken as a whole, provide a flavour of some aspects of the cultural changes we are all experiencing. The way we have put this magazine together is also intended to be a reflection of what we consider to be contemporary culture. We have avoided a linear approach – in which one article follows on logically from the previous one in the structured, didactic format – typical of modern culture. Rather, by taking a more post-modern approach, we have tried to bring together a series of articles that initially may seem unrelated but which, we believe, all contribute to offering perspectives from which readers are invited to allow their own ideas to develop; ideas about the nature of the change that surrounds us, and how we, as individuals, organisations and institutions, might thrive within that change. 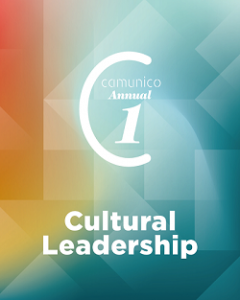 In the article on cultural leadership, we call for a leadership approach that puts at its centre the interdependence between organisations and the cultural context in which they operate. This implies a substantial shift in awareness and requires leaders to view their role in a much broader context. We also recognise that getting there is not easy or something which can be achieved quickly. It will not be reached through a ‘perfectly constructed management development programme’, so many of which we have seen come and go. Yet we see many organisations that are well embedded in our contemporary culture. They have finely tuned ‘cultural antennae’ and ways of organising themselves and doing business that, at a very fundamental level, are different from traditional organisational structures and approaches. For such organisations rapid, radical cultural change is their source of excitement, creativity, exploration and business success. We hope that you will find this annual interesting and thought-provoking. And that will inspire some ideas and initiatives that will contribute to your continued success.